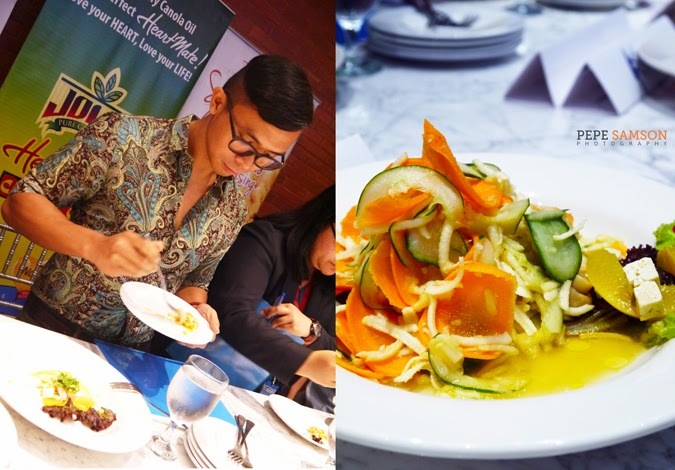 Home / CCA Manila / chef jonnathan em / cooking / events / food / katipunan / The Foodie / Flame On Part 1: Becoming Chef for a Day ... Say Hi to Chef Pepe Samson! 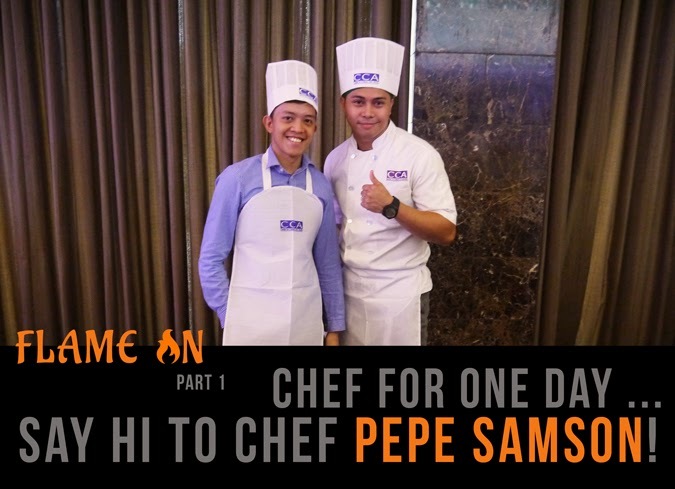 Flame On Part 1: Becoming Chef for a Day ... Say Hi to Chef Pepe Samson! 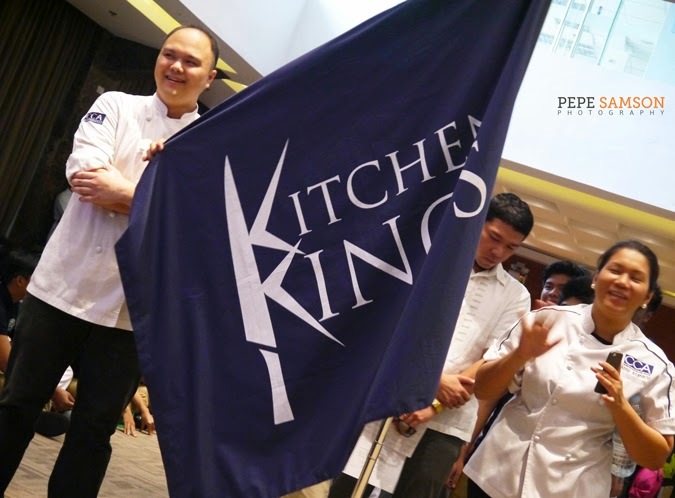 In all the years I religiously followed Hell’s Kitchen, bursting into laughter (and a scream: “SAYANG!”) whenever Chef Gordon Ramsay whacks a wellington with his hand or hurls a plateful of overcooked scallops against the wall, never did I think I myself would be in an actual cooking competition. With my dancing skills, I bet I would've performed a lot better had I been part of the cheering team. LOL! OK fine, not exactly cooking—more like, salad-making. Cold apps, as Chef Gordon would say. 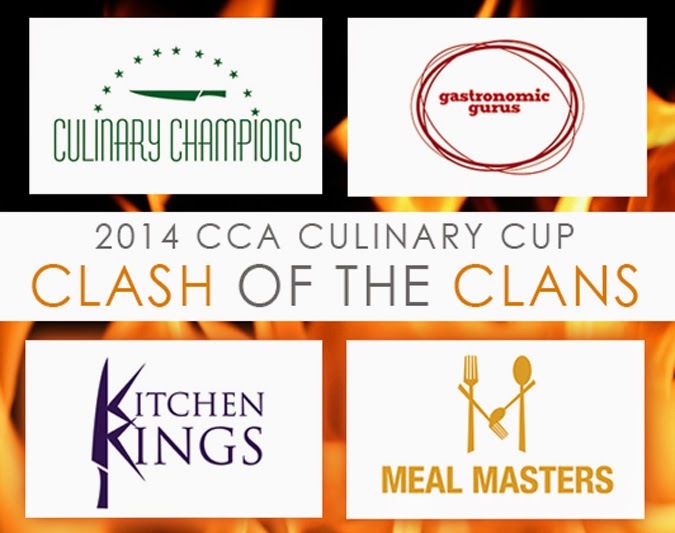 I went to the Center for Culinary Arts’ cooking showdown event, the Clash of the Clans, blind and clueless—not knowing I wouldn’t just watch the students battle with each other in the kitchen, but be an actual participant! And you know what, I couldn’t hate them CCA peeps even if I force myself to, because in truth, I ABSOLUTELY LOVED IT!!!! 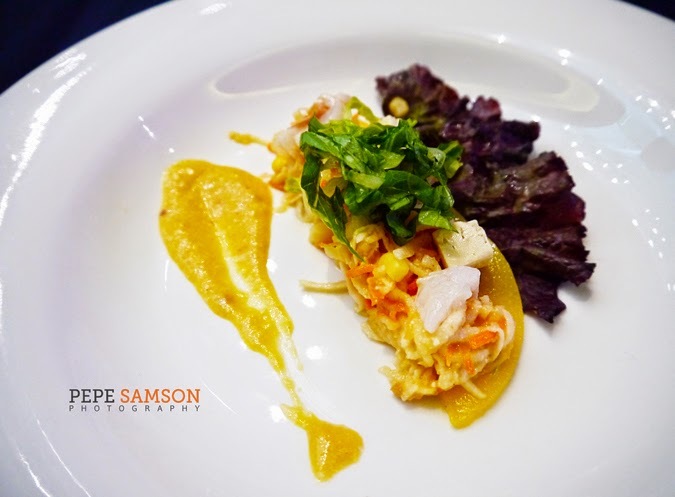 I attended the 2014 CCA Culinary Cup’s preliminary event armed with only my camera, not realizing I should’ve reviewed how to properly cut vegetables beforehand as well, LOL! When I arrived, the friendly people of CCA ushered me to my seat as the program was about to start. Barely a few minutes after settling in, they informed me that … SURPRISE! I’m part of a “Quickfire Challenge” in the day’s affair. Soon, students from the 4 CCA Houses paraded inside the events hall—the Meal Masters, the Gastronomic Gurus, the Culinary Champions, and The Kitchen Kings, all bearing their pride, passion, and a fighting spirit I truly admire—a student feeling I miss. 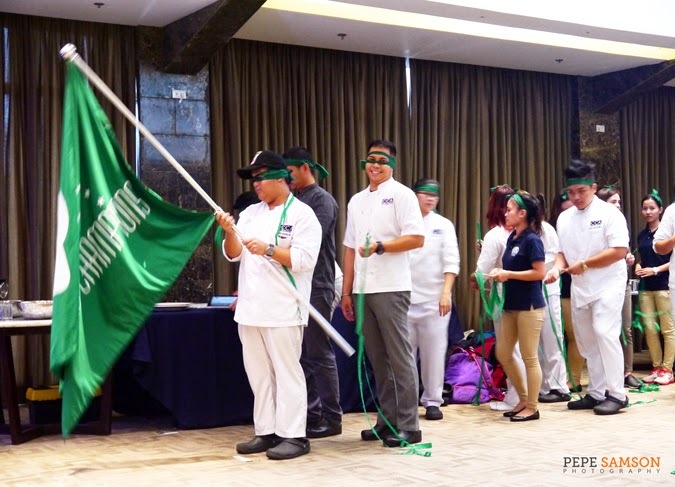 Chefs, faculty members, and CCA heads addressed everyone with welcoming words and advice, and as the program went on I knew I was trapped but I was excited to do this “Quickfire Challenge” at the same time. Ms. Liza Morales (CCA Operations Manager). 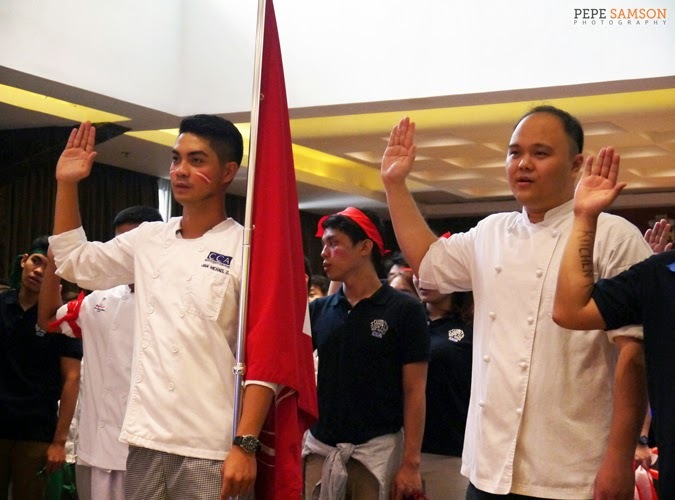 The chefs say their oaths. 2013 CCA Cup Champions: the Kitchen Kings. Coaches and chancellors of the 2013 champions. 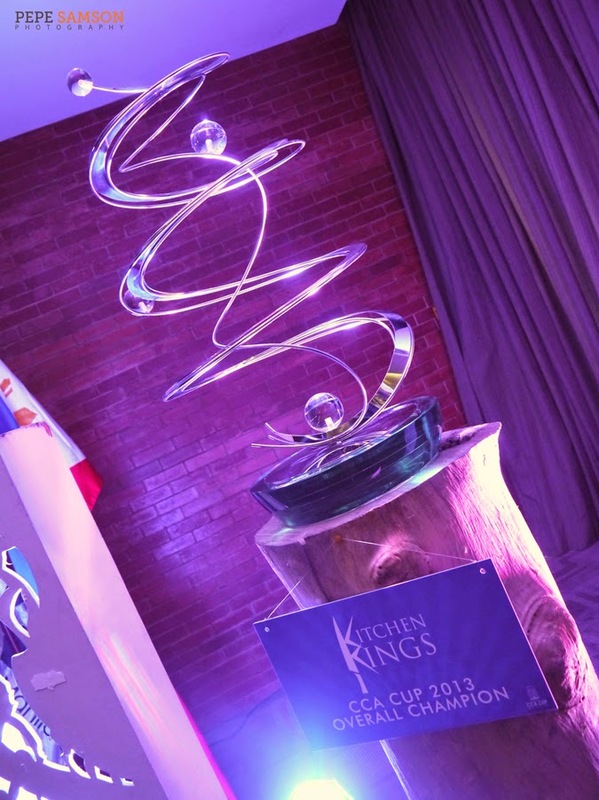 Eye on the prize: who will claim this trophy this 2014? Except there really wasn’t any fire or flame or stoves or ovens at all. We were making salads! I was disappointed because I was totally ready to show them my frying skills (LOL)! But seriously, what a relief or I would have to check every 5 or 6 seconds if I was setting any fixture on fire. I got into the Culinary Champions House (green: Slytherin, yay!) 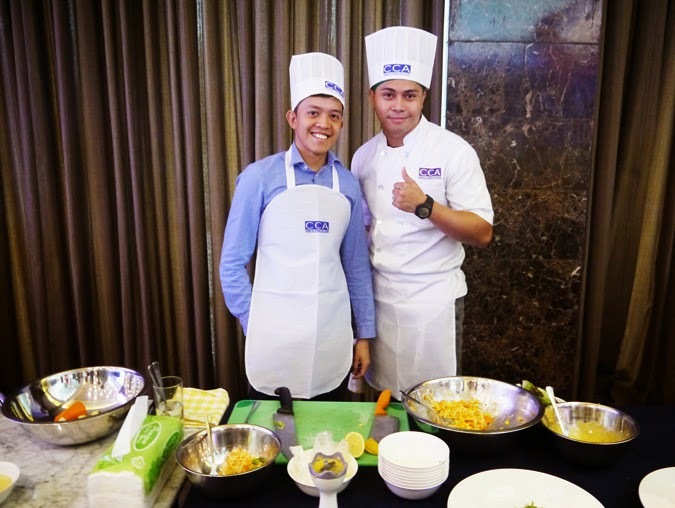 and was paired with Chef Jonnathan Em. Three other fellow bloggers joined the other 3 houses. Being the eternally-competitive person I was, I refused to lose! Not when my prepping skills is as good as being thrown out of the kitchen by my lola because I couldn’t even slice string beans evenly! LOL! Yes, I was ready for battle! 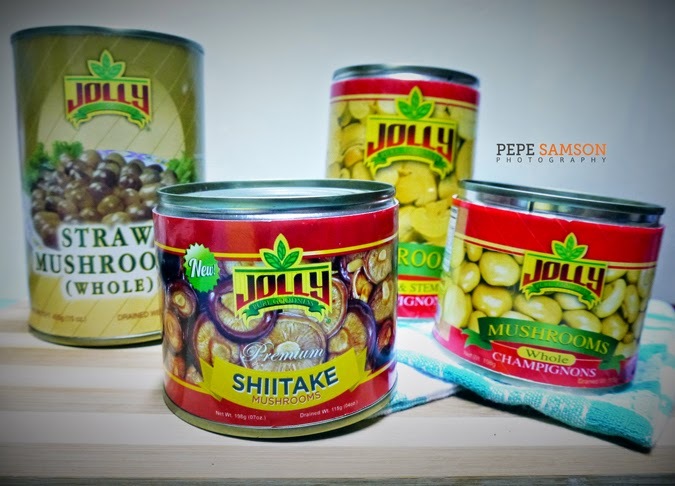 Within 20 minutes, we had to pick ingredients from the selection of products sponsored by Jolly Foods and Dona Elena. I never realized Jolly had such a big assortment of items! All I see in the nearby supermarket are canned sliced mushrooms! Now I know they have whole, straw, and shiitake variants as well! Cool! Chef Jonnathan picked out the ingredients for our “Jolly Salad”—a salad composed of the 4 mandatory ingredients (apple, turnip, carrot, and cucumber), plus some lychees, peaches, feta, lettuce, and a honey mustard dressing. When I saw Chef Jonnathan pick some of my favorite things in the world (Feta! Honey! Mustard! Wine! ), I knew this was going to be perfection. 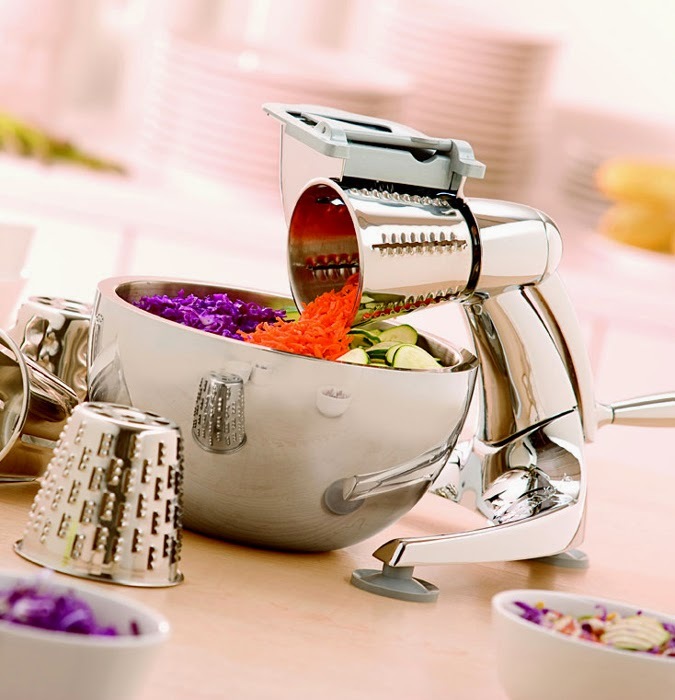 While Chef Jonnathan amazingly did his thing, I preoccupied myself with the Salad Master, a very PepeSamson-friendly kitchen equipment which instantly shreds your fruits and vegetables all via simple grinding motions. Yes, that was my only contribution to his awesome salad dish! Easy, right? Haha! OMG, I seriously want a Salad Master at home! It was awesome how Chef Jonnathan could think of a combination so quickly. Barely 10 minutes into the cook-off, he was already plating. Yes, in case you’re wondering, I didn’t forget to copy the sous chefs at Hell’s Kitchen and wiped the sides of the plate clean myself, haha! The judges taste our salad. 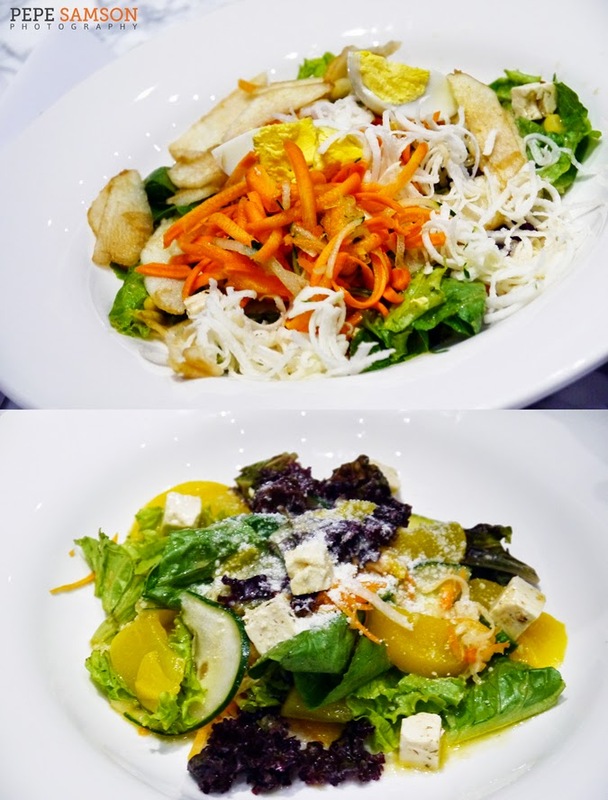 Salads created by the Meal Masters and the Kitchen Kings. 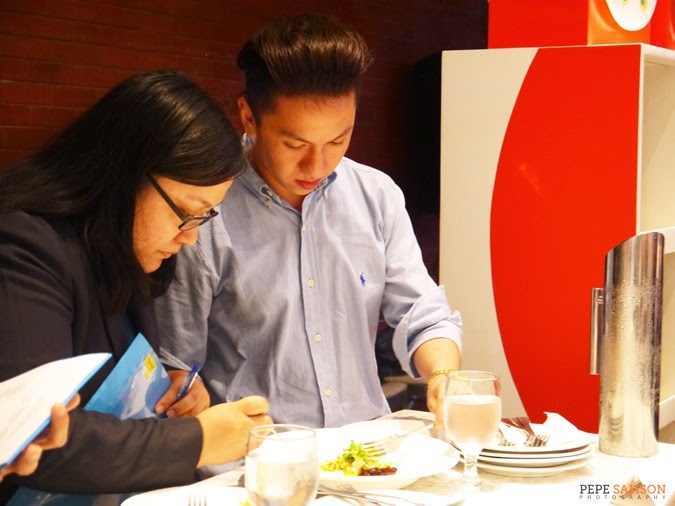 Another judge taste the creation of the Gastronomic Gurus. … and it was US! Chef Jonnathan and me! The Culinary Champions! Yes!!! I helped the Culinary Champions earn a few house points with my shredding skills! Hahaha! 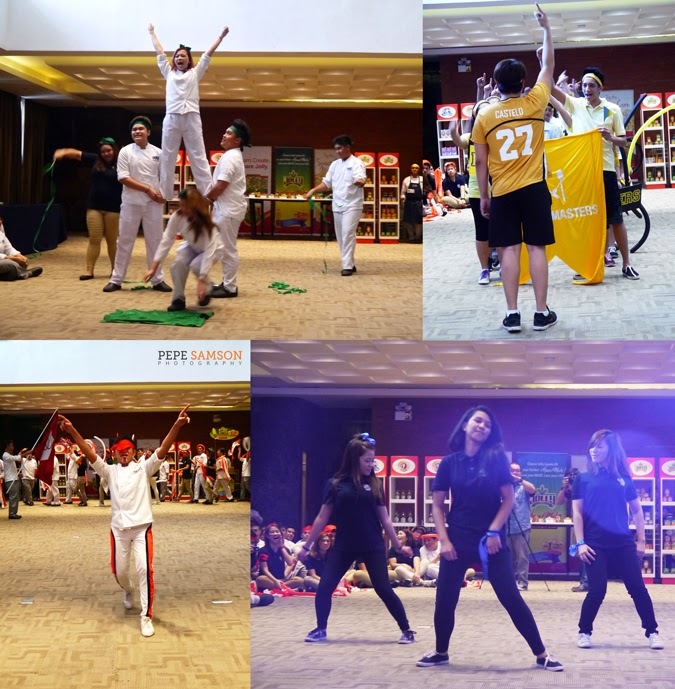 The students were howling with glee and I felt like I was one of them too (#feelingclose LOL) but honestly, it felt great to be part of such an enthusiastic crowd. It’s easy to underestimate a seemingly easy thing to do such as assembling a salad but in the few moments that I was there on the table, slicing lychees unevenly and grating fruits and veggies, I got a glimpse of how it was like working in the kitchen. Acting under time pressure, making sure everything is hygienic, ensuring nothing goes to waste, and communicating with others—especially with the mentors, in my case for that day, Chef Jonnathan. I would think working in line is ten times more demanding than that. 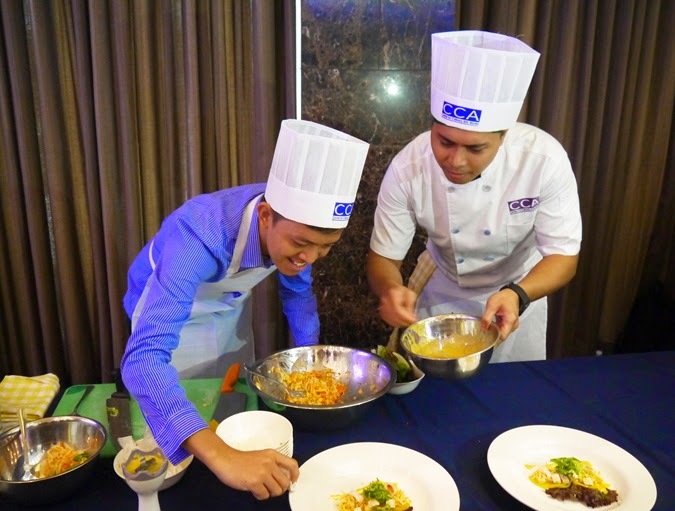 It was exciting and memorable and a bit like role-playing (“Yes, Chef!”)—and I feel like enrolling in CCA! Haha! We were given gift packs from Jolly Foods, Dona Elena, and Hershey’s—as well as a huge basket of goodies. Thanks for the early Christmas basket, haha! 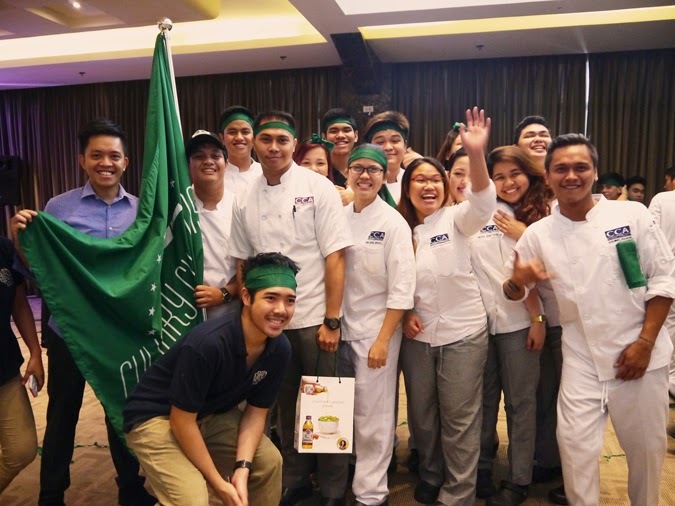 Indeed, being a participant of the cook-off immersed me into the culinary culture of CCA, where everything was about excellence, competitiveness, innovation, and friendliness—both to people and the environment alike. 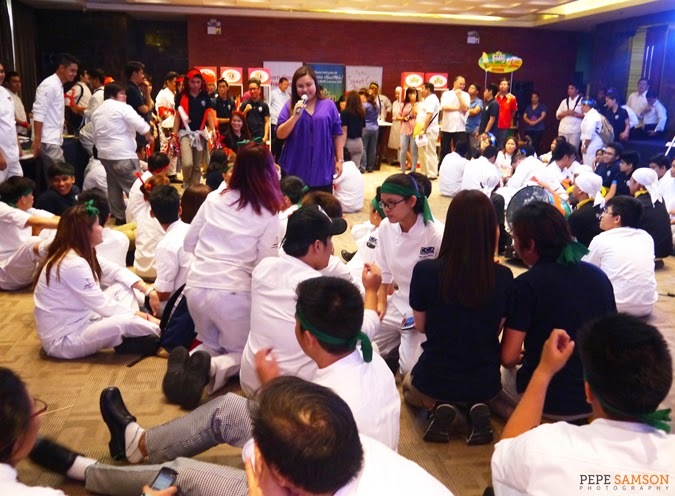 I never realized I would feel all of that in such a short time spent with chefs and fellow food lovers, but somehow it shattered my idea of CCA as an impenetrable circle of elite cooks and chefs. Rather, I saw the other, more personal side: plain people with a love for cooking, who joyfully work with friends, and who are eager to share good moments with new people. 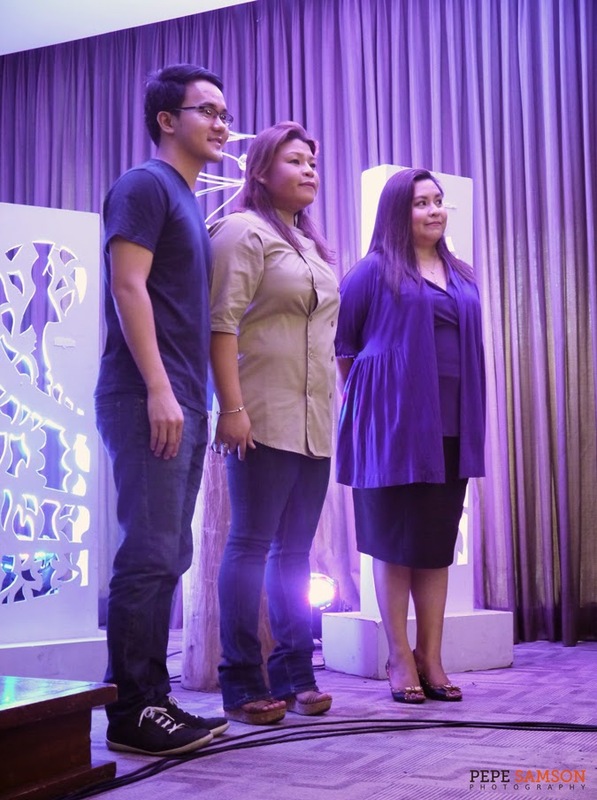 Thank you CCA and Cravings Group for having me in this event! It was an honor to be there and see a whole new color of the culinary world. Tune in to Part 2 of the Flame On series: the actual battle of the CCA Houses in the 2014 Clash of the Clans. 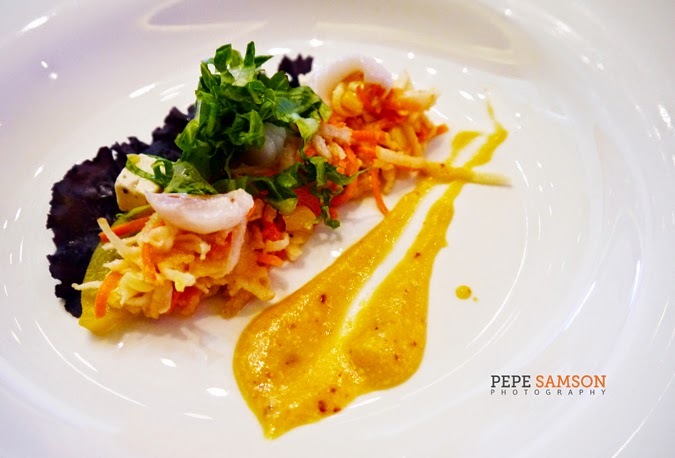 What do you think about Pepe Samson being a chef? Do you think I should enroll in CCA Manila? 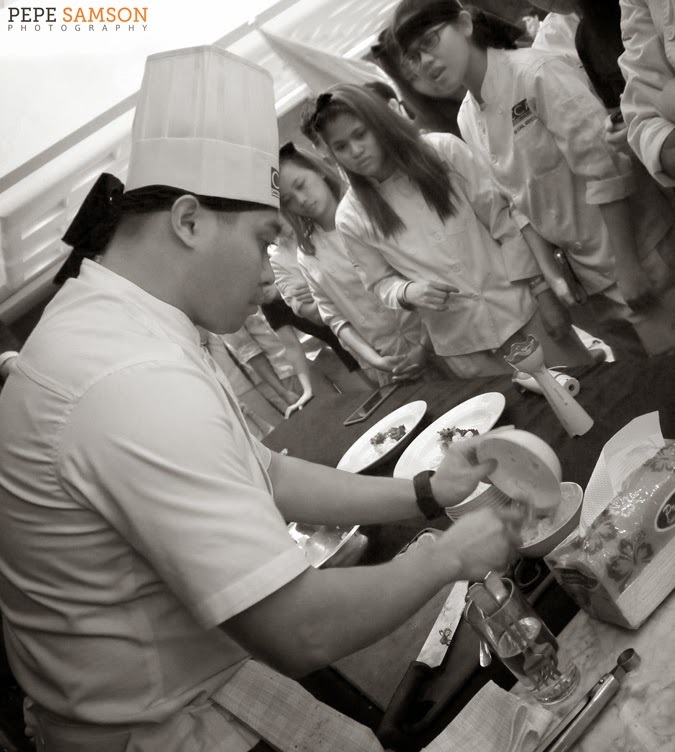 Do you have your own dreams of going to culinary school? Sounds off in the comments section below! Winner! Damang dama ko post mo! Nice shot especially sa trophy! AMAZIIING!! Teka, yung sa may feta cheese samin yun (Gastro.Gurus. hahahaha) Naamaze din ako dun sa Salad Master, natatakot ako nung una baka matanggal daliri ko!! HAHAHA! Tara! Libre mo ko! Haha! Actually natanggal nga daliri ko hahaha joke! Thanks tet! Excited to read your post.